If you need sales associates as we speak try this Now Hiring Immediate Interviews Sign. 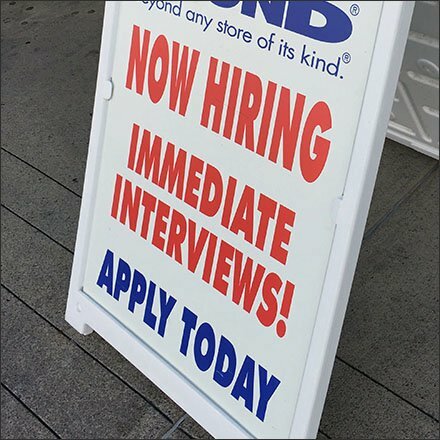 Your on site solicitation should stress that sense of urgency like this sidewalk sandwich sign, stating “Now” and “Immediate Interviews.” None of the delay of filling out paper applications, or submitting a resume online and wondering when you might get a response. This is right here right now “Apply Today” outreach. Considering a Now Hiring Immediate Interviews Sign of your own. Browse this one in the gallery of images.